Pallets are one of the worlds greatest sources of trash. Pallets are used by every industry and every business in some form or another. They can be found behind most shopping centers, stores, warehouses or other places of business. 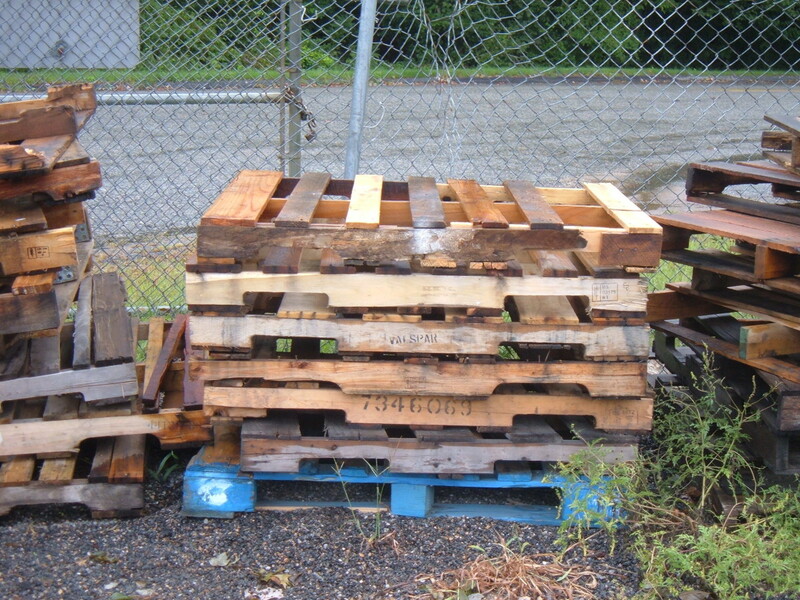 Pallets are a great source of material for project seekers, recyclers and repurposers. By using a little imagination and basic carpentry skills most pallets can be turned into one of dozens of great project. I myself have built pallet chairs, pallet birdhouses and pallet compost bins. 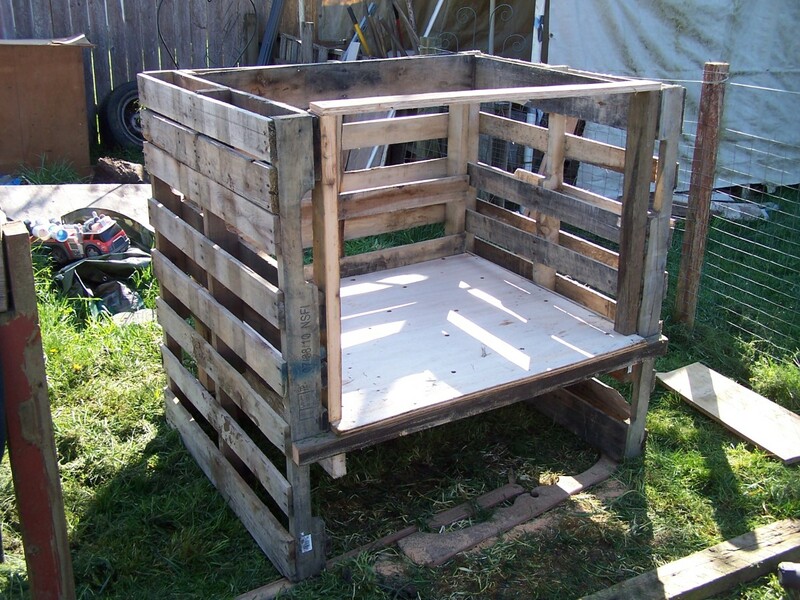 This project, the pallet crate or storage container, is one that I have been contemplating for quite a while. It took me almost an entire year of looking at the pallet before deciding on a direction and I think it was a year well spent. The shape and size of this pallet was calling to me as most do, saying "I'm a great pallet, I'll make a really cool project but what is it going to be". This pallet project is great because it can be used to finish at least five other pallet projects which I have listed below. 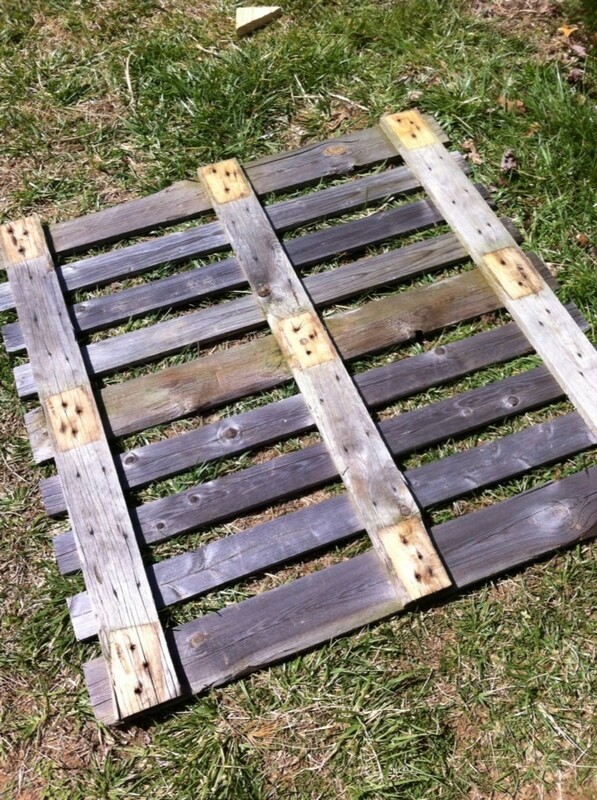 Click here for more pallet project ideas. I think it goes without saying that all pallets are different. 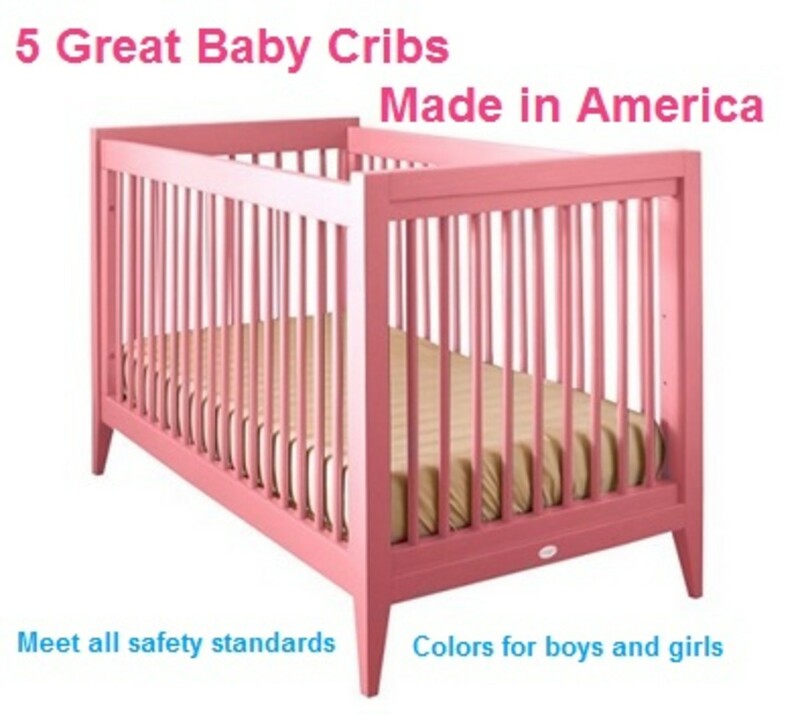 Even pallets made by the same company have variations in construction, size and material. All the pallets I use are hardwood HT stamped pallets. The HT stands for Heat Treated, an internationally recognized method of treating pallets for insects and other potential hazards. The other form of pallets are stamped BT. This means they are treated with Methyl Bromide and should not be used for projects. BT pallets are not only treated with chemicals they are also usually made from inferior soft wood like pine and are not great for building. The pallet I used for this project is one that I have had on my pile for several months. The shape and construction of the pallet called to me, begging to be used for a project. After careful consideration and no small amount of luck I decided to try to make a chest or box from it. My original plan was to make it into a bench but after attempting to remove enough nails from some other pallets to use them for legs I decided it wasn't worth it. I was pleasantly surprised at how well suited to a box type project this pallet was and will keep my eye out for similar pallets in the future. There are two kinds of pallets projects. 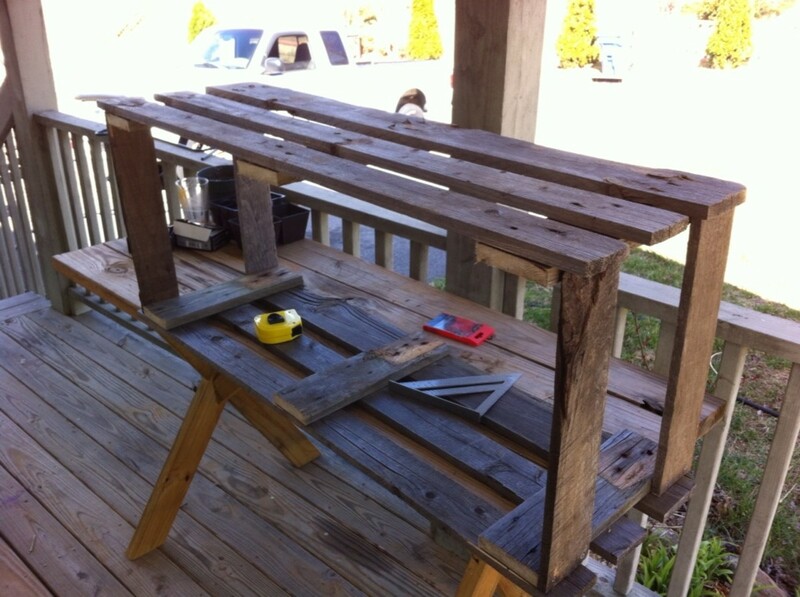 The first is projects you make from recycled pallet wood. 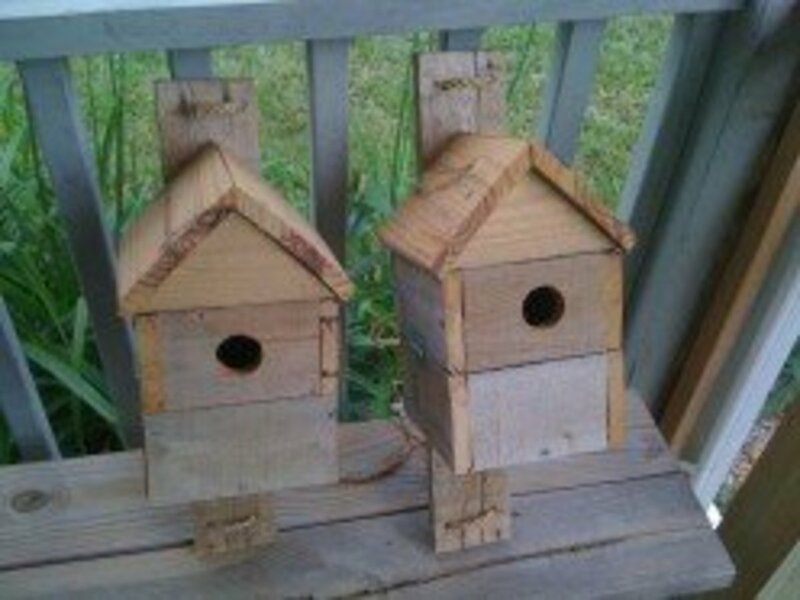 These can be anything you would make from recycled lumber but come at a price. Removing nails from pallets is time consuming and often pointless. Nails break off or bend, becoming hazzards, or the pallet simply crumbles to bits and pieces once the nails are removed. The second kind of pallet project are those made from the pallets themselves. The chairs I build are based on reusing whole or cut down pallets as a building material, not the wood I recycled from pallets. Anytime I use pallets for the lumber it is for small projects like birdhouses. 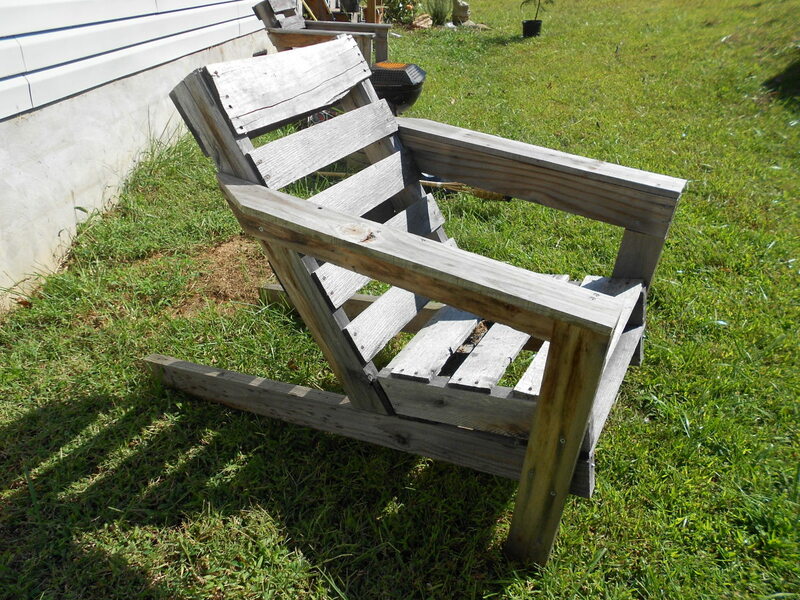 Click Here To Go To My Plans For Building A Pallet Chair. Not all pallets are good for building so it is necessary to choose them with care. First look for clean, unbroken pallets. Split rails or slats may not be a problem for certain projects but they can often indicate other problems with the pallet. Make sure the pallets are stamped HT, these are the heat treated pallets that are safe to use. It also means that the pallets is made from a hardwood and is more suitable for recycling. A lot of pallets I find marked HT are made from oak, cherry, maple or walnut. These trees are often used for making pallets because they are too small for other uses. If you are looking for a pallet in order to build a specific project you will need to take note of its construction. The pallet I used to make this chest was not a good choice for making chairs because it had some parts made from particle wood. If you don't have a project in mind you may be inspired by a good pallet that you find. Are Pallets Safe To Build With? Pallets are safe to build with, if you get the right kind. Some pallets are treated chemically and some are treated with heat. Be sure to check for this before taking a pallet home. HT Pallets are good! HT stamped pallets are heat treated, 100% safe and are usually made from hard wood like oak, maple, cherry or mahogany. BT Pallets are bad! BT stamped pallets are chemically treated with methyl bromide and should be avoided. Even if BT pallets are OK, which I don't know, there are plenty of HT pallets so why bother? Also look for clean, unbroken pallets without loose nails or staples. Check the tops, rails and bottoms for solid joints and make sure that no part you want to use is made from inferior materials or particle board. This pallet lent it self well to chest making. 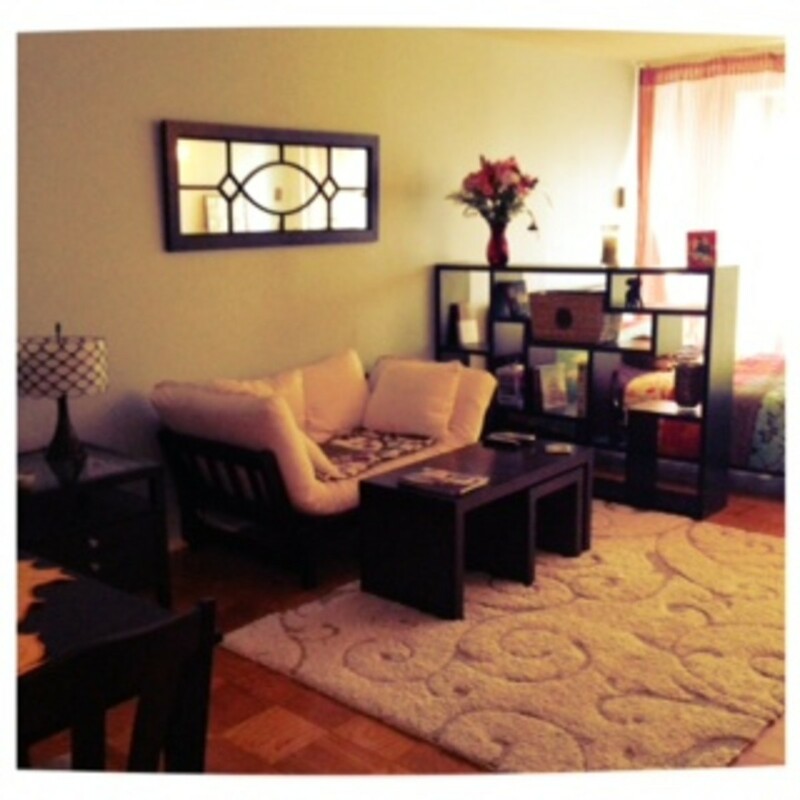 It had a good shape, eye appeal and was in good condition. After I deconstructed the base, which was made from cheaper lumber and some particle board blocks, using the top for a project was a no brainer. It did take a little while to decide on something but once I did it came together in about an hour. to make the chest I cut the pallet into three sections. These sections made the bottom and sides. I connected the two sides together with some boards I cut from another pallet I keep for just that purpose. Once the basic frame of the chest was together I was able to attach the bottom. Pallets Are Not Square. Your pallet is probably not perfectly square but the precision with which it is made may surprise you. Measure carefully, make adjustments to your plans and let the pallet guide you into its final form. For instance, I did not set out to make a chest this size, simply a chest. This is the size chest this pallet made. For best results along the way use a square to make sure the cuts and joints you make are as square as possible. When the bottom was attached and as square as possible, which turned out to be pretty square, I finished of the sides. To do this I used more of the boards I cut from my scrap pallet. This is one area where care is needed. 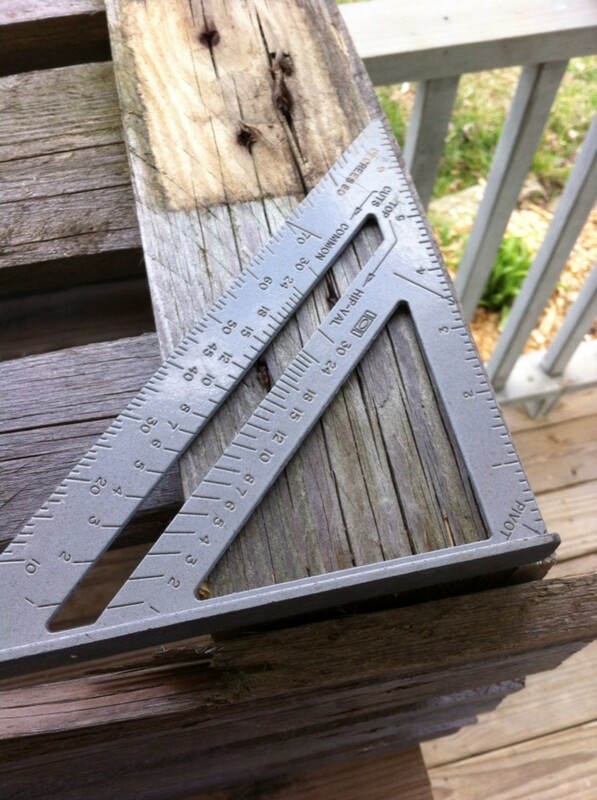 First, measure the sides and bottom to make sure your dimensions are good. Next, when measuring and cutting the boards for the sides be as accurate as possible. Then, when attaching the sides and bottom, it will be much easier to keep the chest square. Always drill pilot holes. 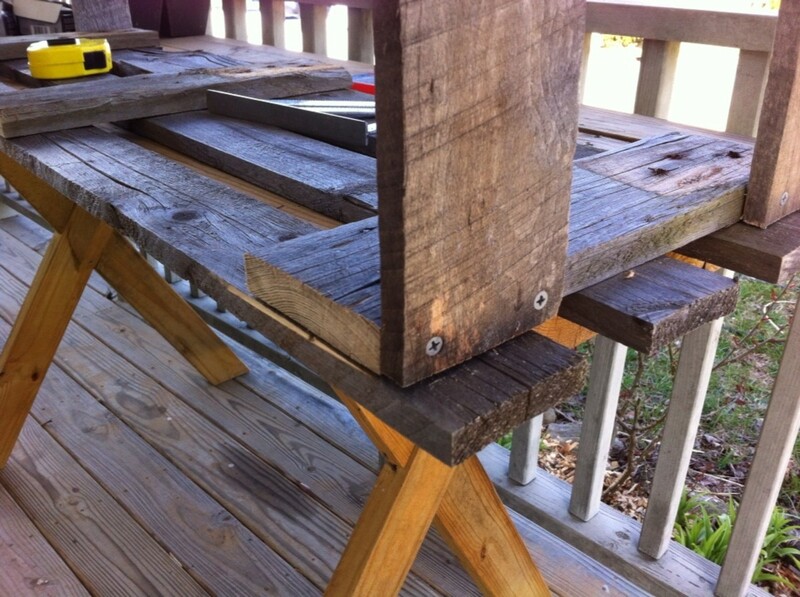 The pallet wood is very dry and easy to crack or split. Pilot holes will alleviate most of this problem and make assemble easier. I have better results when I craft each pallet project. What this means is that I make each piece as I go and attach them similarly. The irregular nature of pallets, despite the factory specs and machine construction, make it hard to prep each piece otherwise. 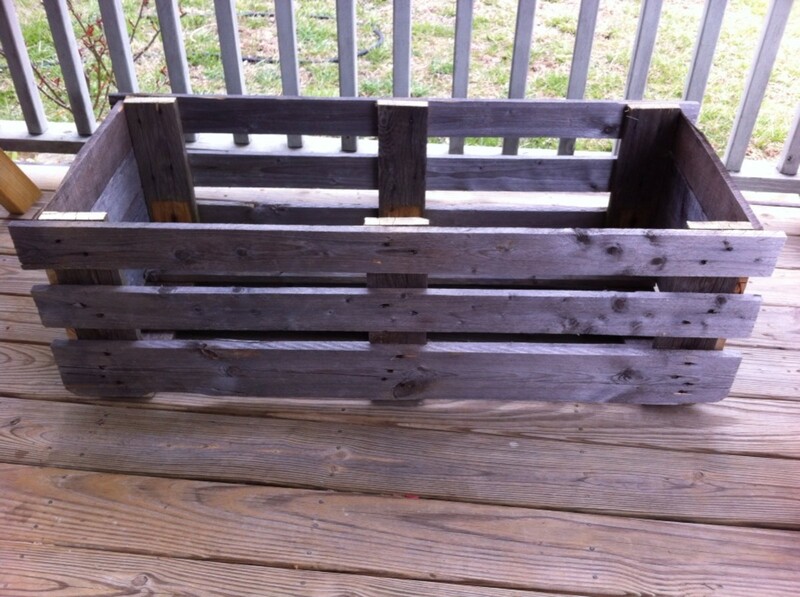 Have You Built A Pallet Project? Adding A Lid - Adding a lid to this project will turn this simple crate into a chest. The chest could be used to store tools, firewood, sport equipment, yard toys or a whole host of other items. Adding A Door - Turn the crate on its side and add a door. This will turn your pallet project crate into a cupboard or cabinet that can be hung in the garage, shed, patio, deck or man cave. Adding Wheels - Adding wheels to this crate will turn it into a cart or wagon. 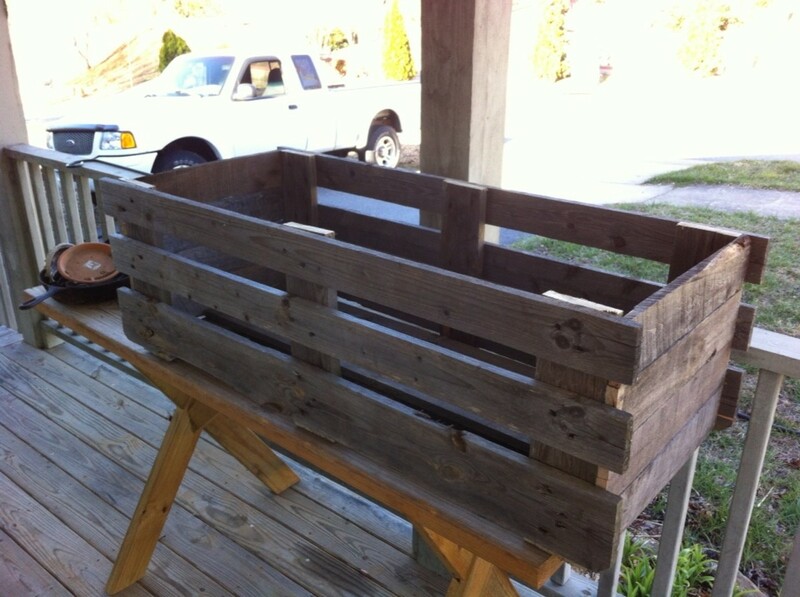 Imagine going to the beach or the park with your awesome home made and hand crafted recycled pallet project wagon. Could also be used in the yard or garden to haul fire wood, yard trash or gardening supplies! Finishing The Inside-Finishing the inside of the chest will make it more useful and could enhance any of the other final projects. A rough pallet wagon is good for tools, dirt or other garden items. A wagon with a finished interior would be good for grandkids, a cabinet with a finished inside might be good for a cabin or man cave. 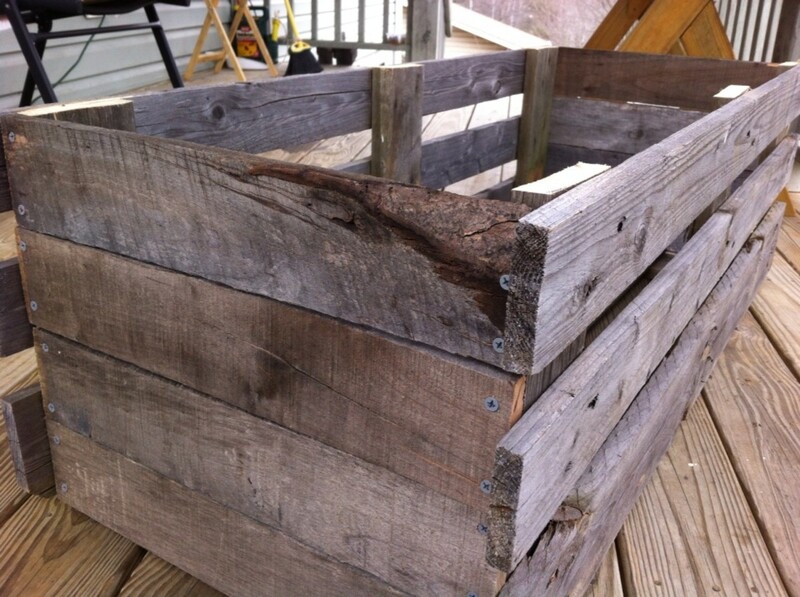 Planter Boxes-These pallet chests also make really good planter boxes. They are free, easy to make and large enough for serious flower or vegetable gardening. Simply fill it with dirt or line it first with plastic, burlap or other landscaping material. Adding a rail to the top edge is a nice touch as well. Definitely getting a vote up! I am OBSESSED with the new pallet furniture trend and definitely wish I was better with a hammer and nails to make everything I see. This seems manageable, however, and storage is something I seriously need.